Hey everyone today I’m doing a Citizen CA0295-58E review. 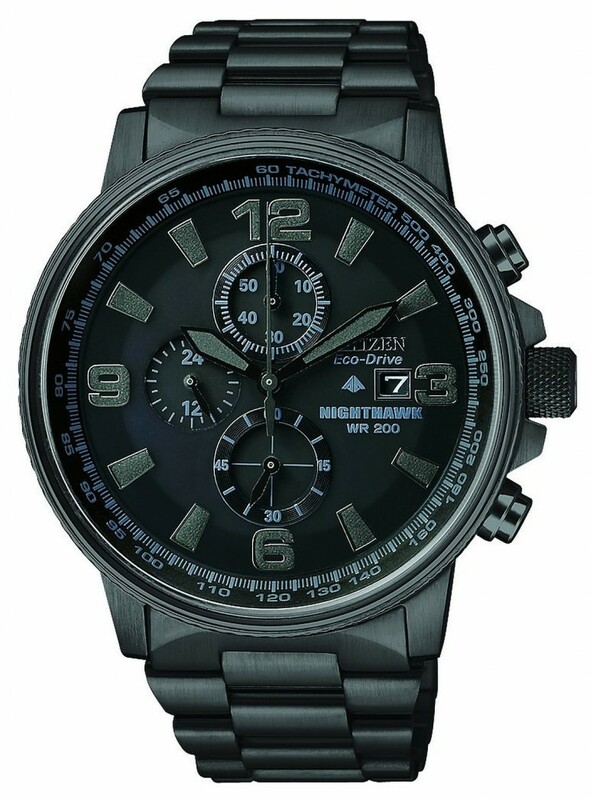 This Citizen watch is actually part of their eco-drive series which means the watch charges up via sunlight and never requires a battery to be replaced. 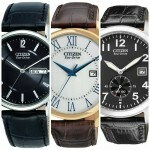 Citizen have a huge range of these style of watches, I summed up my favourites in this top 8 eco drive watches under £200 that is worth taking a look at. This watch is available from Amazon, I’ll get on with the review below and hope you enjoy. So we may have just stumbled upon the perfect all black watch option. 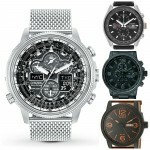 Recently all black watches are becoming more and more popular. Whilst I’m a bit of a fan of them I’m yet to take the plunge and get one myself. I personally see all black watches as more of a fashion piece, and I’ll explain why. A lot of these all black watches are actually a bit of a bugger to try reading in the dark, and while this may not matter to many it is still quite the flaw for others. So yeah if you’re after a cool looking all black watch then this one is definitely a great watch but as far as telling the time in the dark, it has no luminous hands etc to make it any easier. What about that eco drive eh? I love this feature and this type of tech in general. The idea of a watch being able to continuously draw power from a light source and never need to have batteries replaced is pretty damn neat. Most models once fully charged can last in complete darkness for anywhere from 45 days to 5 years! Something else really clever that it does is how it shows you it’s running low on power. Instead of slowly losing time in the day the seconds dial will jump two seconds at a time whilst still keeping the correct time. Impressive right? You’ll know you need to give your watch a little more sunlight with the hassle of having to adjust your time back to the correct place again. The glass on the dial of the watch is made of a hardened mineral. I’ve explained in other reviews but there are kind of 3 levels of protection when it comes to the glass on your watch. There is acrylic which is the most basic and likely to scuff usually found on cheap watches. Then you get this hardened mineral which provides good protection and a lot of scratches can be buffed out. And then you finally get sapphire crystal which is the toughest form of protection but is a lot more costly. I’d say there mineral is a great choice for this watch bearing in mind the price point at which the CA0295-58E is available. This watch is technically classed as a larger dial design. The case diameter is 42mm with a thickness is 13mm, you’ll get a nice weighted feel from the watch without it being completely oversized. A large male watch is classed anywhere between 41-46mm. The thickness is also classed as large being anywhere between 12-14mm. The clasp of the Citizen night hawk is a standard fold over clasp but with an added safety catch. While these may not be my favourite (I love the butterfly clasps) they are reliable and fairly good value. The safety catch adds that extra protection from you accidental opening your watch up and dropping it. The overall design of the watch has a smart feel to it but I think the large numerals almost give it this sporty military feel. The all black designed watches do look pretty cool and will go with most outfits to be fair. Would I wear this watch? Yeah totally and at this price I think it’s pretty good value for money having looked at all the materials and features. So what do I think overall? As I’ve said above I would happily wear this watch and think it does look great however that lacking of readability would probably stop me personally wearing on nights out. I think you have to weigh it up really. If you’re more after a great looking fashion statement then fair play if you don’t mind not being able to read it. Having looked at the parts etc I can say I’m happy with value for money and I’d be happy to get it just not for evenings haha. As always the choice is really up to you. 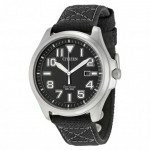 I hope you found my Citizen CA0295-58E review useful. I suggest you take a look around at some of my best of posts, perhaps check out my top 100 under £500. I spent hours putting it together and you may find something you want even more. Hope you found this review useful and enjoyable. You can buy this watch on Amazon.